No need to leave Infusionsoft to implement your campaign. Target specific locations. Select a specific country, region or the whole world. Reach the right people at the right time, no matter where they live. 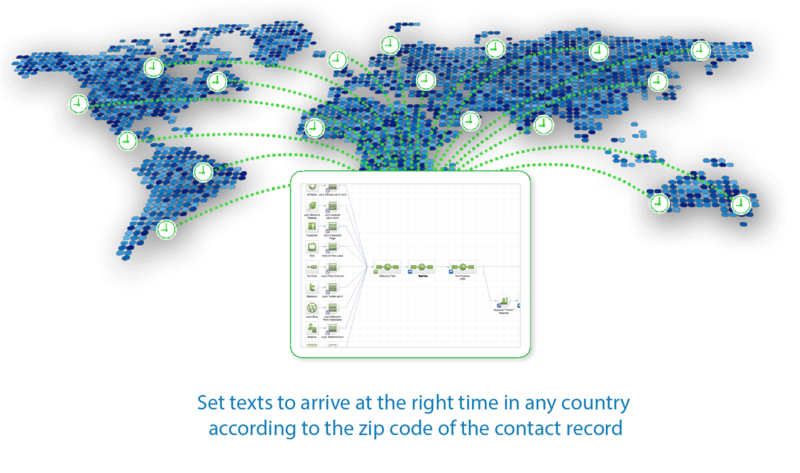 Text your Contacts globally for only a few cents per text, very affordable communication. No need to purchase phone numbers, short codes or keywords. Only pay for outgoing not incoming texts. 80% of emails are never opened. 95% of texts are opened in the first 15 minutes. Attract attention and increase campaign effectiveness. 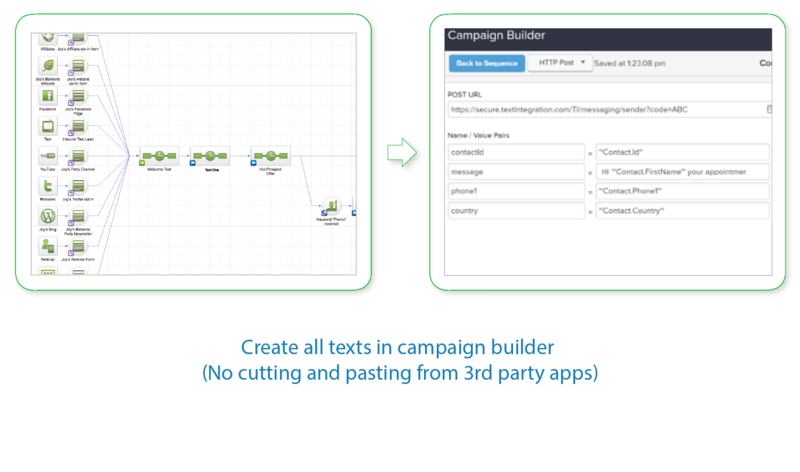 SIMPLE – Use Campaign Builder to build texts into your campaigns. 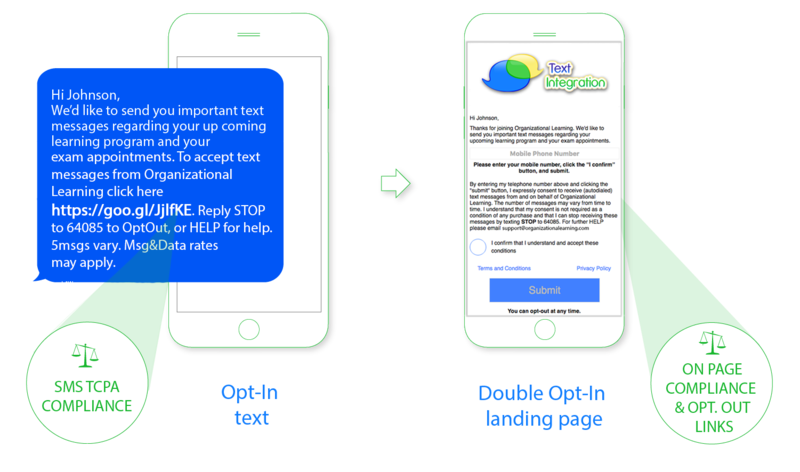 EASY – No need to cut and paste text messages from another app to Campaign builder. 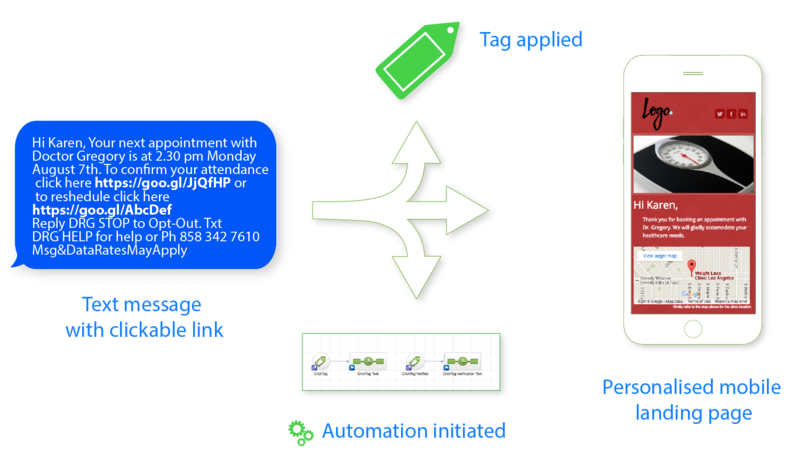 AUTOMATION – Utilize all the automation features of Infusionsoft and Campaign Builder to manage your text communication. We send to nearly every country on the planet! Include a link to any web content in your automated text messages. (We automatically shorten the URL!) Direct contacts to landing pages or order forms or downloadable coupons, videos, booking page … any web content! We integrate with the World’s best web page template providers. e.g. Lead Pages / WordPress etc. This means you can send a text that links to a mobile optimized web page that can contain merge fields. (e.g. 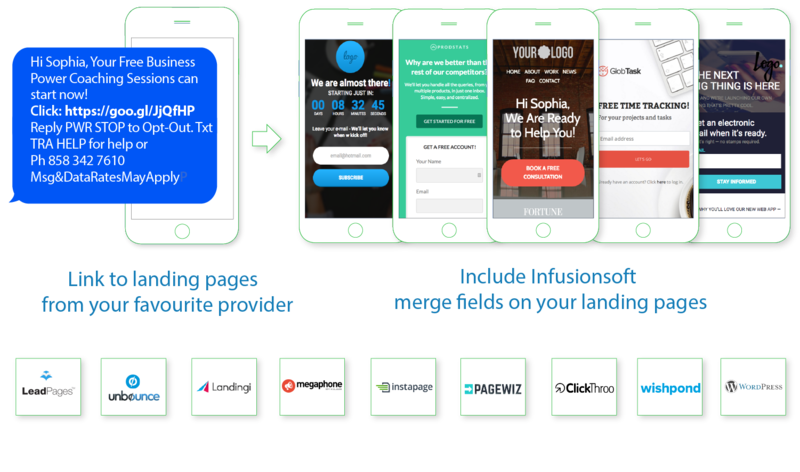 personalised landing pages!) You have 100’s of pre-optimised mobile friendly templates and are not constrained by a limited number of templates or any one page builder! Make appointments or reschedule an appointment from a text. Use any appointment calendar or one that Integrates with Infusionsoft. 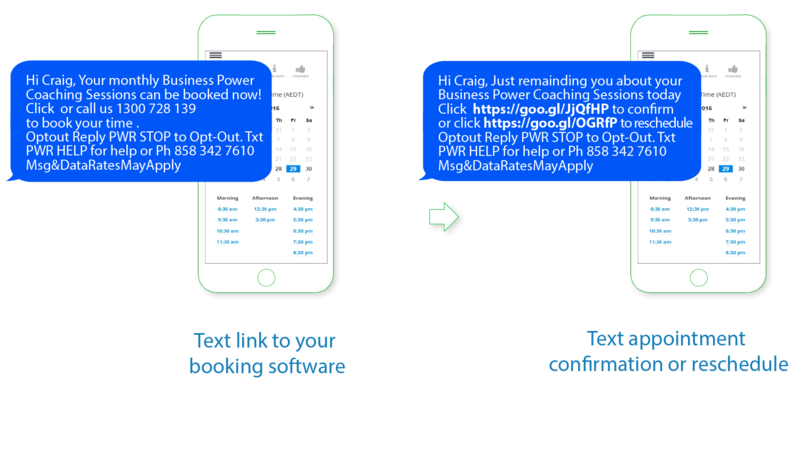 Send reminders, seek confirmations, set bookings and reschedule …..all automated and from a text! 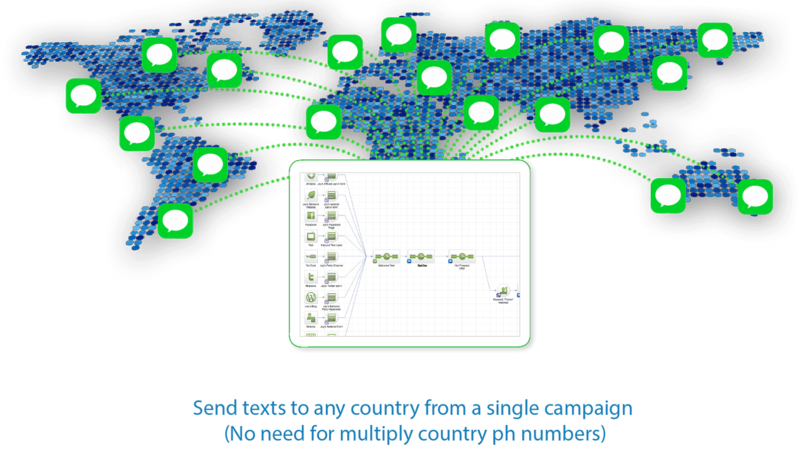 Send time specific messages to any country / time zone. e.g. 9:00 am in the USA or 9:00 am in Spain, Australia or UK! Send time sensitive sales offers. Comply with anti-spam laws that govern the times you can deliver a text. 1. Double Opt In Processes. 3. Country Specific Timed Delivery. 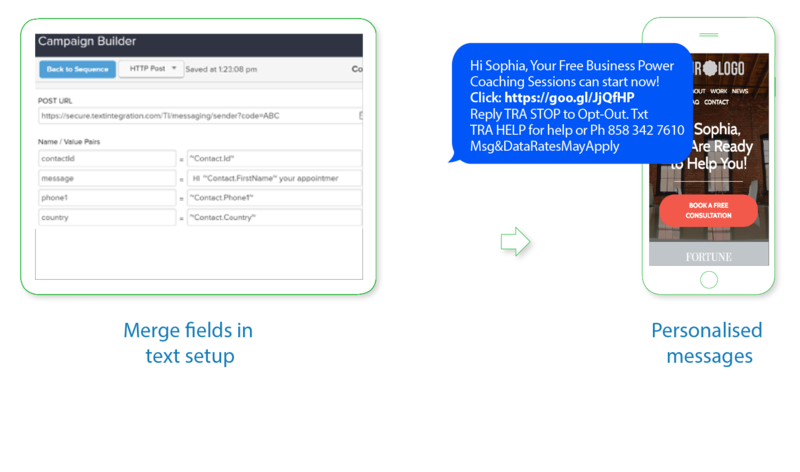 Include Infusionsoft merge fields into a text message. Merge contact name, email, login credentials, promo codes, dates plus many more. APPLY TAGS FROM A TEXT! 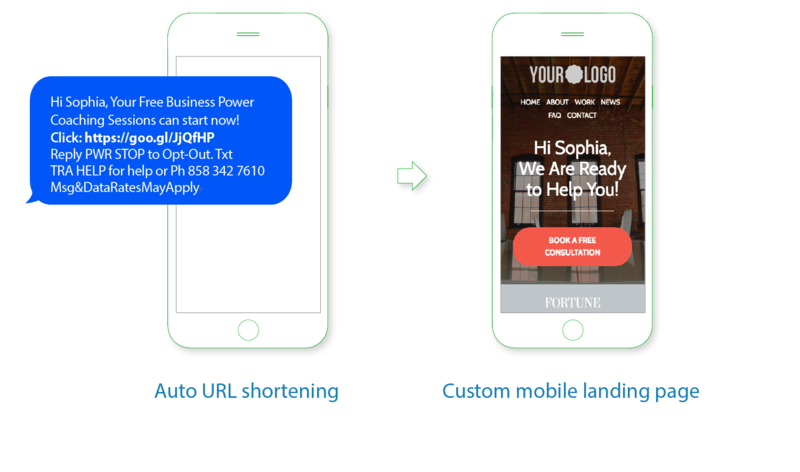 Send a text with a mini URL that applies a tag and opens a webpage simultaneously. AUTOMATED TWO WAY TEXT CONVERSATIONS. 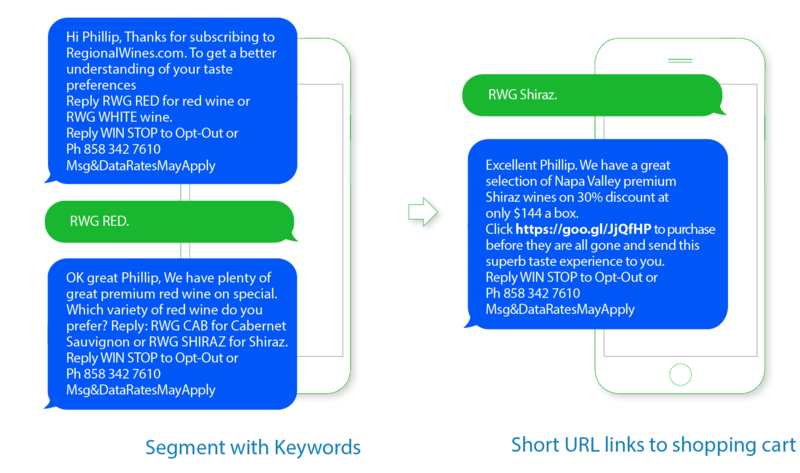 Enjoy unlimited FREE keywords or use Click Tags to conduct automated two way text conversations via text. * Keywords only applies to selected countries i.e. United States, United Kingdom, and Australia. [Click Tag or Clickable Links provide the same functionality, in a cheaper way, and in all countries]. 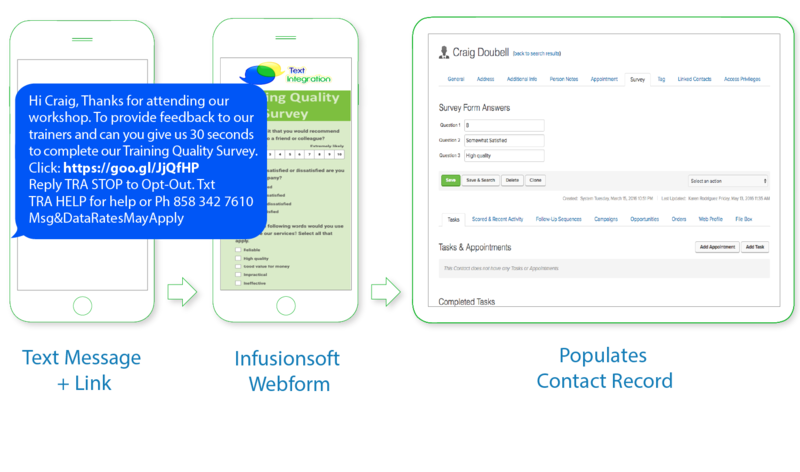 Send a text with a mini URL to an Infusionsoft Webform and the completed data will be stored in the customers Contact Record.